U.P. Amsterdam isn’t just a little bit different from any other gym that you’ll find in Amsterdam, it’s a lot different. Nestled amongst the canals of the Jordaan district, our Amsterdam Personal Training gym started out life in the year 2012 as Evolve Amsterdam, with Michael Henskens and Sander Beenders at the helm of a personal training business that was in their own words “modeled off the inspiration of Ultimate Performance and our admiration for the industry leading results that Nick Mitchell and his team generated at an astonishing speed”. Fast forward to the end of 2016 and Evolve had “evolved” into an operation that was renowned across the Netherlands for educating and coaching the best personal trainers in Amsterdam. Our respective management teams got together and decided that adding the U.P. culture and internal processes that inform our “maximum results in minimum time” philosophy could take Dutch personal training to the next level, by giving our Amsterdam-based personal trainers the career and education platform that has been a key driver behind U.P. being known as the world’s leading personal trainers. 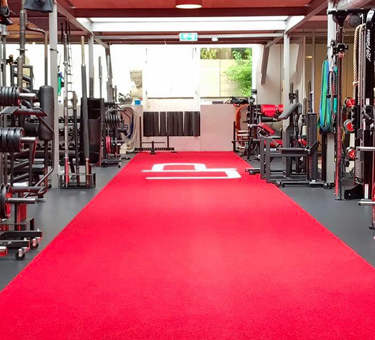 We have added to the already excellent Rozengracht gym with €250,000 of additional equipment and have created an environment that would be something special in any city that it graced. There has never been a high-quality Amsterdam gym that catered to the serious trainer, to the man or woman who wanted to get something a little extra from their gym sessions and who didn’t take a “little extra” to mean a bank of plasma screens in which to watch MTV whilst they spin their wheels not losing body fat on the exercise bikes. We are not a personal training studio. Too often personal training studios are small, cramped spaces devoid of equipment and options. That’s not U.P. Amsterdam – we have everything and more than you could ever need, the U.P. difference is that we are never full of herds of people like busy commercial gyms. We are a family. As sentimental as this may sound it is also very true. Our founder Nick Mitchell has created a nurturing environment where everyone pulls for the other, and this holds true of all U.P. gyms throughout the world. Given that we impose a limit on the number of personal trainers who are allowed to use our gym you quickly get to know all the faces and names and be inspired by the hard work and results of others. Can we back up our strong claims? Have a look at our Real Results to make up your own mind and see that U.P. Amsterdam is the real deal.